This page reports on changes to our flea market web site. We'll also place notices here regarding schedule or venue changes, or problems and work-arounds that may affect flea market attendees. We have completed and agreement with Fry's Electronics to hold the 2019 season of the Electronics Flea Market in their parking lot at the Sunnyvale store. This means that the entire March 9 through September 14 season will be held in the east side parking lot at the Sunnyvale Fry's Electronics. Fry's Electronics has agreed to have the balance of the Electronics Flea Market in their parking lot at the Sunnyvale store. This means that the May 12 through September 8 Electronics will be held in the east side parking lot at the Sunnyvale Fry's Electronics. Due to a generous arrangement with Fry's Electronics, we are moving the April 14, 2018 flea market to the Fry's Electronics Flea Market in Sunnyvale (directions). This new arrangement allows us to keep the flea market financially viable. Due to cost increases over the past two years we need to increase our vendor fee to $30. This is effective with the March 2017 flea market. Although we tried to organize a flea market for October 10, 2015, we were not able to get all the pieces together in time to make it happen. There is another event using the parking lots at De Anza college on September 12, 2015. The other event starts around 10 AM at Memorial Park across Stevens Creek Boulevard. We ask our vendors to clear out as soon as practical after our 12:00 PM closing time to accommodate this other activity. Some additional cost increases for 2015 force us to adopt a small price increase ($.25 / item) at the food and beverage concession stand. Due to increasing costs, we have decided to increase our fee to $25 per vendor space. A vendor space is two consecutive parallel parking spaces marked with the same number. We have a few spaces that are three parking spaces, which are going to be priced at $45. Please correct change to speed your entry into the flea market. ASVARO announces the 2014 schedule of the Electronics Flea Market held at De Anza College in Cupertino. The markets are scheduled this year on the second Saturday of each month March through September. The plan is to locate the flea market in lot B each month under the solar panels. The October Electronics Flea Market has been canceled because of the conflict with Pacificon the same weekend. We are again scheduled to have our flea market season at De Anza college in Cupertino. Our first market of the season is scheduled for March 9, 2013. Unfortunately, Pacificon has been scheduled for the same weekend as the October Electronics Flea Market. We expect many of our buyers and some of our vendors to be at Pacificon and might not be at our flea market. 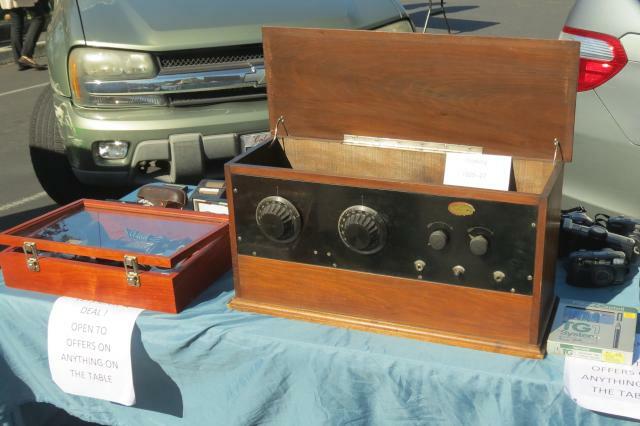 In light of this, the West Valley Amateur Radio Association has decided to cancel our October flea market. September 8th will be the last flea market for 2012. Please spread the word that the September Electronics Flea Market is the last one for 2012. The next market after that is scheduled for March 9, 2013. Due to conflicts with the Farmers Market in lot A and other events on campus we’ve moved the Electronics Flea Market to lot B. Lot B is under the solar panels near the lot C parking garage. Good news is the panels provide light in the early hours and some shade during the hotter months. We have confirmed that the flea market is going to be in lot A this year. No more messing around with lot B and its solar panels. We are preparing for the 2012 Electronics Flea Market season. The Silicon Valley Red Cross is our first sponsor this year. Note that on campus parking fees have increased to $3. Bring clean $1 bills to feed the daily parking permit machines. The October 8th flea market is moving down to parking lot B. This is the parking lot just south of usual location, so you should not have any trouble finding it. The September 10th flea market has been canceled because of construction on the De Anza college campus. We only received the notice this afternoon, so we have scrambled to get the word out. Note to buyers/sellers that there is construction occurring in parking lots A & B on the college campus. This is not affecting the flea market itself, but buyers may need to park in different locations on campus since space in Lots A & B is limited. We are doing our best to mitigate the problem with signage, staff to direct buyers to parking, and requesting permission to use parking space not normally available for buyers to use (e.g “staff” parking and “30 Minute Visitor” parking). Added another E-Waste recycler to the recycle page. To better manage the cardboard problem, cardboard shall be collected at a single location to keep it out of the trash and to ease disposal. De Anza College is complaining about E-Waste being left in the trash. Please do not put electronic waste into the trash. It damages our relationship with De Anza and violates California law. Also, there is far too much cardboard being dumped at the market. No more cardboard boxes are to be dumped in the trash. First flea market scheduled for this Saturday, March 28, 2008. Coffee and doughnut prices are going to $1. Announcement for RadioFest Monterey on February 23, 2008. An article in the San Jose Mercury News has caused some confusion between the Electronics Flea Market and the De Anza Flea Market. See our home page for a clarification. Another recycler added to the recycle page. We have received reports of counterfeit USB flash (thumb) drives being sold at the April flea market. The counterfeit drives look legitimate and even report as high-capacity drives (1, 2, 4, 8GB), when connected to a PC, but they actually have 1/2 or 1/4 of the stated capacity. Make sure you know what you’re buying and who is selling it to you. Remember the adage that if it sounds to good to be true, it probably is. More details about counterfeit/fake USB flash drives being sold on eBay. New updated web site unveiled. Transfer ELECTRONICSFLEAMARKET.COM domain to ASVARO. First Flea Market in new location. Will finish out the year at De Anza College. Click here for Directions/Maps. Last flea market at the Sunnyvale location. Change of Venue !! — New location is in Sunnyvale in the Lockheed Parking lot. 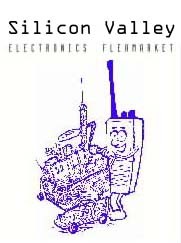 Moved the Flea Market web site to its own domain, electronicsfleamarket.com. The lots have been re-designated from alpha designators to numeric. The 1st lot on the right as you come into the main entrance is #1 and the progress upwards to the last lot on the right at the main entrance (where the Flea Market is), lot #7. I’ve added a graphic illustration of the campus drive and some tags that I hope will help. Just click on the ’Campus Map’ icon in the navigation bar. Foothill College changed the main drive to a one-way circle. I’ve been informed by Security that this is a permanent change.